Before permanent lunar encampments such as Clarke's Clavius Base or Heinlein's Luna City, could be built, there would have to be the first settlers - the first people to set up shop and try to eke out an existence on the Moon. Walking On the Sea of Clouds is the story of such lunar pioneers: two couples, Stormie and Frank Pastorelli and Van and Barbara Richards, determined to survive and succeed in this near-future technological drama about the risks people will take, the emergencies they'll face, and the sacrifices they'll make as members of the first commercial lunar colony. In the end, one will decide to leave, one will decide to stay, one will put off deciding...and one will decide to die so another can live. 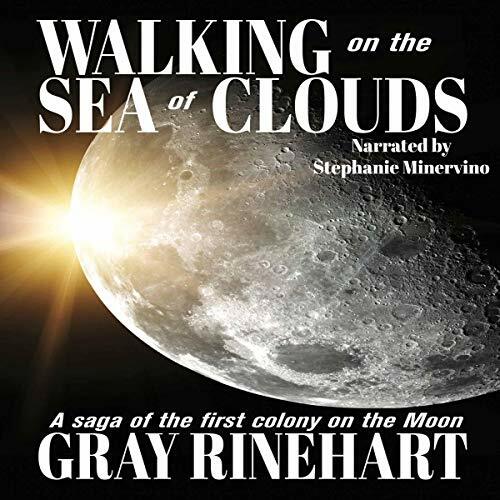 Walking on the Sea of Clouds is a great Sci-Fi adventure by Gray Rinehart, available now as an audiobook, performed by Stephanie Minervino. This is Mr. Rinehart's first fully fledged fiction work, but he has a lot of experience writing and editing non fiction and other fiction novels. I started to listen to Walking on the Sea of Clouds last week, I finished it in three relatively long sittings and now, after thinking about it for the last few days, I am ready and willing to write this review. The year is 2034 and humanity is looking to the stars for a new home. The action follows four main characters, two couples, as they leave a quiet life on Earth in order to live on the Moon. Each and every one of them has their own reasons for embarking on this journey, filled with perils and threatened by the unknown at every step, but the wish for discovery and the reward of being pioneers of space exploration far outshines the potential unwanted consequences. The story revolves around these brave individuals, Stormie and Frank Pastorelli and Van and Barbara Richards, and I can say that the character development is great, the plot is very well thought out, backed up by deep research on the author's part, while at the same time a few well placed creative licenses makes it even more interesting. The audiobook version of Walking on the Sea of Clouds is brought to life by actress and voice over artist Stephanie Minervino. As this is her first recording for an audiobook release, I can tell you that she did great! Stephanie reads in a clear and soothing voice, giving each character his or her own personality, with subtile changes in tone, accent and cadence. She infuses the dramatic scenes with urgency and she delivers the many lines of poetry present in this novel with talent and passion. I will be on the lookout for any new releases from Gray Rinehart and I will definitely like to listen to more audiobooks performed by Stephanie Minervino. I recommend this book to anyone in search of a good Sci-Fi adventure, that delves more into what makes us what we are as human beings and less into how many aliens we can kill if on a strange planet. Please vote Helpful below if you liked this review and find more of them here on Audible and on theAudiobookBlog dot com. I post honest reviews at the author / narrator / publisher's request.